On November 4, the day Americans chose the son of a Kenyan economist to be their president, the eastern Congolese town of Kiwanja was assaulted by a band of several hundred militiamen, who were festooned with leaves and armed with rifles, spears and machetes. Technically, the fighters–some of them children–were acting in tenuous alliance with the faraway central government; their enemies were soldiers loyal to a rebel leader named Gen. Laurent Nkunda, who had occupied Kiwanja a few days before. But the battle was really more like a skirmish between rival gangs, and as is so often the case in these sorts of clashes, it was the defenseless who suffered the most. Nkunda’s men repelled the attack and then turned their fury on Kiwanja’s civilian population, going from house to house, rooting out the men and boys, accusing them of complicity with the progovernment forces and executing them on the spot. According to Human Rights Watch, which compiled an extensive report on the killings, townspeople later recovered around 150 bodies, some of which had been stuffed into pit latrines by the rebels. The entire time, a detachment of United Nations peacekeepers sat less than a mile away, oblivious to the slaughter. It’s actually more complicated than that. Within the field of battle Prunier describes–the eastern rim of a country roughly the size of the continental United States west of the Rockies–there were many nameless little wars, which often had little to do with one another or with the larger national and geopolitical stakes. The conflict created dozens of nebulous microstates ruled by local strongmen who profess allegiance to some higher power or another, but who in practice rule their domains in an almost feudal fashion. The title of Prunier’s book invokes the two great conflagrations of the twentieth century, but in the book itself Prunier argues for a more distant analogy to explain the bloodshed in Congo: the Thirty Years’ War, which wracked Europe from 1618 to 1648. Both were fitful conflicts fought by a shifting cast of combatants who met on the neutral ground of a failing state–the sclerotic Holy Roman Empire in one instance; the rotten kleptocracy of Mobutu Sese Seko in the other–and waged devastating campaigns of plunder. In both cases, the civilian casualties were appalling. (It has been said that some parts of modern-day Germany saw their populations reduced by one-third during the Thirty Years’ War.) And each war, Prunier argues, represented “a transforming moment in the history of the continent.” What Congo has been transformed into, however, and what its recent history portends for Africa’s future, are questions of intense debate. Africa’s World War proffers an answer, and it arrives with an aura of definitiveness. Prunier would seem to be an ideal chronicler for this liminal struggle. A profession-straddler, part journalist and part scholar, he has written a book designed to appeal to readers of magazines and monographs alike. Though wrapped in glowing jacket endorsements from several eminent professors, it is free of the ritualized fustiness of academic writing. War correspondents also love Prunier’s work: Howard French, who covered Congo during the 1990s for the New York Times, recently placed Africa’s World War on a list of books he thought President Obama should be reading. But unlike most journalists, Prunier was thinking about this part of the world back when it was still at peace. After serving in the French army in the late 1960s, he spent two years teaching in Idi Amin’s Uganda, and he broadened and deepened his knowledge during a long period of travel around the African continent. He returned to France to earn a PhD in African history, in 1981. In the book that made his reputation, The Rwanda Crisis, he brought a perspective informed by decades of intellectual engagement to the moral incomprehensibility of the 1994 genocide. Published in 1995, when the world’s bewilderment was still fresh, the book met with an enthusiastic critical reception–David Rieff lauded it as “magisterial”; Christopher Hitchens called it “beyond praise”–and many experts consider it the most useful volume in what is now a very crowded library of Rwanda books. Prunier’s latest work, like the Congo war, is a sequel of sorts. And as in the Thirty Years’ War, a religious conflict that evolved into a clash of emergent national interests, the story does not end as it began. The fighting in Congo started–or at least it seemed to start–as a very modern crusade, a righteous campaign against perpetrators of genocide. Five million deaths later, it’s clearly about something else. A note of caution about the previous sentence: beware of large numbers in Africa. The much-cited figure of 5 million dead comes from a longitudinal study conducted by the International Rescue Committee, which relies on household surveys and sampling methods in a country where there are few roads, hospitals or reliable records. In keeping with a change in the way the world understands war casualties, the study’s mortality figure encompasses “excess” deaths in Congo due to a wide variety of causes, such as malnutrition and diseases that would have otherwise been preventable. Even during the worst periods of fighting, the study says, violence accounted for less than 10 percent of the conflict’s death toll. Any way you look at the situation, it’s horrific. But the scale of Congo’s killing does not compare to, say, what occurred during the years of war in Vietnam, where an estimated 3.8 million Vietnamese died from violent causes alone, according to a study published by the British medical journal BMJ that employed similar survey methodology. Armed hostilities in Africa tend to be localized, intimate and haphazard. This is what made the Rwandan genocide such an extraordinary occurrence: not just the scale of its evil but its ruthless efficiency. At the exhortation of an extremist government committed to “Hutu Power,” a willing populace butchered an estimated 800,000 people, most of them of the minority Tutsi ethnic group, in the course of just a hundred days. In The Rwanda Crisis, Prunier placed the genocide’s organizing forces in a historical and cultural context and showed how Western powers–he was particularly scathing with regard to Belgium and France–missed clear signs of what was coming. Because lists like that have been circulating in the Great Lakes for thirty years. Everybody [is] always planning to kill everybody else, and all the extremists on all sides are always trying to convince the whites that they have discovered some great conspiracy and they are going to tell you all about it, when of course it is just a political tool against their enemies. So we just thought this was one more of these things. Instead, Prunier writes in Africa’s World War, the specialists “suddenly found themselves sitting on top of a heap of 800,000 corpses they had not seen coming.” The international community had no idea how to respond. In the name of human rights, one agency of the United Nations created a tribunal to try the perpetrators of the genocide, while another, citing the same principles, set up camps across the border in Congo that sheltered and fed Hutu refugees, passing no judgment. If the outsiders were indecisive, however, it appeared that the Africans knew how to respond. In 1996, a rebellion broke out in Congo’s far eastern provinces. The guerrillas quickly advanced across the country, chasing the refugee génocidaires and the dispirited army of the dictator Mobutu, who had given sanctuary to the killers because he opposed Rwanda’s new Tutsi-led government. It was little secret that the “rebels” were actually proxies for Rwanda, but who could object? The intervention seemed only just, and the overthrow of Mobutu by Laurent Kabila (father of the future president Joseph), in May 1997, was greeted with exhilaration. The first phase of the war was over, and the region had a pair of new kingpins: Yoweri Museveni, the president of Uganda, and Paul Kagame, the de facto ruler of Rwanda, both of whom had backed Kabila’s offensive against Mobutu. The two shared a common history. Kagame, raised in Uganda by exile parents, had fought in the rebel force that had brought Museveni to power and had gone on to take leadership of the Rwandan Patriotic Front (RPF), the Tutsi-dominated army that conquered his home country in the aftermath of the genocide. In the late 1990s both leaders were hailed by Bill Clinton, among others, as leaders of an African “renaissance.” That brief era ended, if it ever really began, with the outbreak of the second phase of Congo hostilities in 1998. In The Rwanda Crisis, Prunier was reasonably sympathetic toward Kagame, but in Africa’s World War he casts Rwanda’s president as the villain, apologizing in an endnote for wanting “to believe in the relative innocence of the RPF.” His sense of disillusionment matches that of a number of Great Lakes specialists, such as the late Alison Des Forges of Human Rights Watch, who by the end of her life was banned from entering Rwanda because of her strident criticism of the RPF. The title that Columbia University’s Mahmood Mamdani gave his book on Rwanda, When Victims Become Killers, sums up the overall turnabout in the narrative. Prunier makes it clear he’s determined to revise previous judgments. Early in his book, he revisits one passage from The Rwanda Crisis, his account of the death of the RPF’s first military commander, Fred Rwigyema, contending that the leader–a national hero in Rwanda–was not killed in a friendly fire incident, as he wrote in 1995, but was actually assassinated, probably on Kagame’s orders. The truth of this assertion is hard to assess–rumors about Rwigyema’s death have circulated for years–but the fact that Prunier states it so boldly, naming no sources, is an indication of where he’s headed. Certainly, Kagame is not an easy man to like. In contrast to Museveni–who has an appealing personality and gets off fairly easily in Prunier’s book, despite his army’s involvement in some of the bloodiest Congo episodes–Rwanda’s president is an aloof, soft-spoken and secretive man. He’s not a democrat, and he’s not subtle about it: he won more than 90 percent of the vote in the last presidential election, in part because he’d had many prominent political opponents arrested. There is credible evidence that he’s supported militias in the Congo led by accused war criminals, and judges in Spain and France, under the doctrine of universal jurisdiction, have been investigating allegations–none of them proven–of various RPF misdeeds. Nonetheless, Kagame has continued to enjoy decent relations with the United States, where he’s cultivated useful alliances with evangelists like Rick Warren. His professed desire is to turn Rwanda into a prosperous little autocracy like Singapore. He explains the beginning of the war’s second phase with a characteristic anecdote. In 1998, Laurent Kabila, the ideologically pliant revolutionary whom Rwanda had installed as a stooge, started to resist his patrons and ordered all RPF troops to leave Congo. An important Rwandan general named James Kabarebe went to visit Kabila and tried to shoot him, Prunier reports, but was thwarted and instead fled back home to organize another invasion. This gripping story is sourced to an anonymous “relative of one of Kabila’s bodyguards.” It’s the sort of secondhand tale that another writer might have saved for the bar, considering that Kabila’s bodyguards were hardly reliable. After all, one of them did eventually assassinate him, in 2001. Rwanda’s 1998 lightning offensive reached the outskirts of Kinshasa, and would have toppled Kabila if Angola had not intervened on his behalf. The conflict erupted into a continental war, pitting Rwanda, Uganda and multiple rebel armies against the Congolese government, Angola, Zimbabwe and various less-involved states. Almost as soon as these alignments came together, however, they broke down. The rebels split into a bewildering array of feuding factions; Rwanda and Uganda battled over the contested city of Kisangani; and Kabila was murdered, possibly with Angola’s connivance. The war entered its third phase, the confusing scramble for spoils. Most of the national actors were at least partially motivated by security concerns–Rwanda, Uganda and Angola were dealing with domestic insurgents who had bases in Congo–but their actions quickly made a mockery of official rationales. All the parties set about looting the territories they occupied of gold, diamonds, timber and other natural resources. Rwanda made a profitable trade in coltan, a mineral that is used in cellphone components. Some analysts have suggested that the United States and other Western powers encouraged this round of fighting to get in on the mining action, a theory Prunier dismisses as a “post-Leninist bogey.” “Regardless of the opinion one has of President Kagame’s leadership it is absolutely necessary to recognize that he is nobody’s puppet,” Prunier writes. “This is always the problem of conspiracy theories applied to Africa: they purport to denounce the evil visited upon Africans by ill-meaning foreigners and they end up with Africans looking like perfect dolts, manipulated here, pushed there, used for this, deceived into that.” Once again, he reserves his most scathing criticism for Rwanda, which distinguished itself, he claims, by making plunder a matter of state policy. While other countries’ generals enriched themselves, the Rwandans apparently invested their ill-gotten wealth in their army. However one might classify it, the account was produced by a pattern of argument that recurs throughout the book: Prunier introduces substantiated charges, proceeds to eye-popping allegations and then barrels off the deep end. His zeal undermines his cause. He spends a great many pages describing reprisal massacres committed against Hutu refugees in Congo during the first phase of the war, events that clearly occurred. Then he adds flimsily sourced embellishing details, like the account of an RPF “killer team” dispatched from the Rwandan capital of Kigali and commanded by James Kabarebe, whose members carried “in their knapsacks small cobbler’s hammers which they used to silently and efficiently smash skulls.” Finally, he makes some extremely questionable calculations to come up with the estimate that 300,000 refugees were murdered. A number with that much political weight shouldn’t be thrown around carelessly. Indeed, it gives support to the contention that the RPF engaged in “counter-genocide,” an allegation voiced by Kagame’s enemies for years. Prunier practically lionizes one of these opponents, Seth Sendashonga, a Hutu who served as interior minister in the RPF government until he fell out with Kagame in 1995 and went into exile in Nairobi, where he became one of the RPF’s loudest accusers. It appears as if, having mistaken reports of genocide for political slander once before, Prunier wasn’t going to let skepticism fool him again. By the end of Africa’s World War, the author’s detachment has vanished, and he is fulminating against gullible foreigners who saw the conflict as a “fantasmatic soap opera,” with the Hutu génocidaires playing “Darth Vaders” to the RPF’s “lightly cavalcading Luke Skywalkers.” These simpleminded people believed Paul Kagame was “Moses ushering Africa into that Brave New World” and thought that his entry into Congo would lead to a “virtuous cleaning of the African Augean stables.” As I read this wild cavalcade of hyperbolic metaphors, I started to wonder if I’d picked up some lost Nabokov novel, where the urbane narrator, Professor Prunier, gradually reveals himself to be a raving loon. Then I read the appendix titled “Seth Sendashonga’s Murder.” In it, Prunier describes how the exile leader was shot dead under mysterious circumstances in Nairobi in 1998. Before the probable assassination, Sendashonga had become “fed up with always playing the good guy,” Prunier writes with sympathy, and had formed a rebel force of 600 men and “around forty officers of the ex-FAR”–that is, veterans of the army that organized the 1994 genocide. He was making plans to infiltrate Rwanda. Prunier discloses that an exiled friend of Sendashonga’s wrote letters begging him to raise funds for the rebellion, and implies that he did indeed help. Prunier says he also made contact with elements of the government in Uganda, which at the time was starting to grow estranged from Rwanda, and arranged for Sendashonga to meet a general named Salim Saleh. This is a discrediting admission on two counts. Obviously, Prunier’s involvement as a partisan undermines any claim to objectivity, which is a shame because many of his criticisms are valid: Kagame started the war and was more responsible than anyone for assuring that it continued. But the company Prunier was keeping also raises questions about his political judgment. Salim Saleh is the powerful brother of Yoweri Museveni, Uganda’s president. According to a UN investigation, he was one of the major profiteers in the Congo war. Elsewhere in the book, Prunier writes that Saleh was in the illicit diamond trade “up to his neck” and describes how the general fomented an ethnic conflict in the eastern region of Ituri for reasons “so cold-bloodedly commercial that few observers dared to believe it.” These misdeeds still lay in the future at the time Prunier introduced Saleh to his friend, but even then no one had any illusions about the general’s character. The Congo conflict’s long denouement has been dominated by figures like Saleh, small men who wage war as a business proposition, and they likely represent the episode’s lasting legacy. A decade ago, the political scientist William Reno predicted that in an era of globalization, failing states would have a tendency to degenerate into fiefdoms that sustain themselves through the extraction and sale of natural resources, a system that “more closely resembles the decentralized subcontracting structure of a successful global firm such as Nike than an inefficient, centrally organized, mammoth firm such as General Motors.” Reno called this “warlord politics,” a term that nearly perfectly describes what happened in Congo. This was a war that escaped from its masterminds. Eventually the foreign armies retreated, leaving behind their proxies, who developed minds of their own. Joseph Kabila, thought to be a weakling when he took the place of his murdered father, defied all expectations. “Devoid of any national constituency,” Prunier writes of the younger Kabila in one of his many penetrating insights, he “decided to treat the international community as his power base.” It was a canny strategy. A peace treaty was signed, and development aid, which Kabila used to strengthen his rule, flowed into the country. He won a legitimizing election in 2006 over another former rebel leader, Jean-Pierre Bemba, whose campaign was hindered by allegations of wartime atrocities. (Among other things, it was said his troops had practiced cannibalism against Pygmies, which would have been considered an electoral disqualifier in any country but Congo. On the campaign trail, Bemba made a memorable denial, claiming, “The Pygmies are alive and well.”) Last year Bemba was arrested in Belgium and sent to face judgment before the International Criminal Court on war-related charges. But most of the warlords have been brought into the fold of Kabila’s government, having been induced to make their separate peaces by some combination of fatigue, financial concessions and cajoling. By late last year the only serious remaining rebellion was one in the province of North Kivu, led by Laurent Nkunda. Nkunda was a true creation of the war: a member of Congo’s tiny Tutsi population, he reputedly served in the RPF before joining the leadership of a North Kivu-based rebel group, which subsequently splintered into many parts. As the last holdout, Nkunda, a fiery part-time evangelist, claimed to be fighting to protect his people from genocide. In reality, his army, the National Congress for the Defense of the People, was little more than a criminal enterprise with interests in a number of lucrative trades, including fuel smuggling. According to the United Nations, until at least last fall–the time of the Kiwanja massacre–Nkunda was receiving material support from the Rwandans. The degree to which they controlled Nkunda is a matter of dispute, however, and at some point he seems to have become a liability. 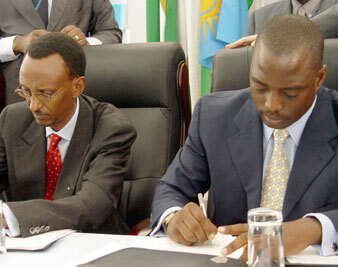 In late January Rwanda and Congo struck a secret deal and launched a joint attack on Nkunda’s stronghold. He fled into Rwanda, where he was arrested. A surviving remnant of Nkunda’s army, commanded by a disloyal subordinate–an indicted war criminal–switched to the government side, and all three forces turned to rooting out an estimated 6,500 Hutu militiamen, the last remnants of the génocidaires, from the hills of North Kivu. After thirteen years, the Congo conflict had returned to its original grounds. Whether it ends there, however, will be up to the warlords.